This dessert is one of my favorites. Although you have to put a little work into it, the results can be described with one word: Yummy! Dovetailing tip: Use the prepared nectarines from Meal 2 in place of the peaches. Cut the angel food cake into squares and place half in the bottom of a glass dish. Spoon half of the peach slices over the cake. Cover with half of the yogurt mixture. Place remaining cake squares over the yogurt. Top with peaches, reserving 5 or 6 slices for garnish. Cover with remaining yogurt mixture. 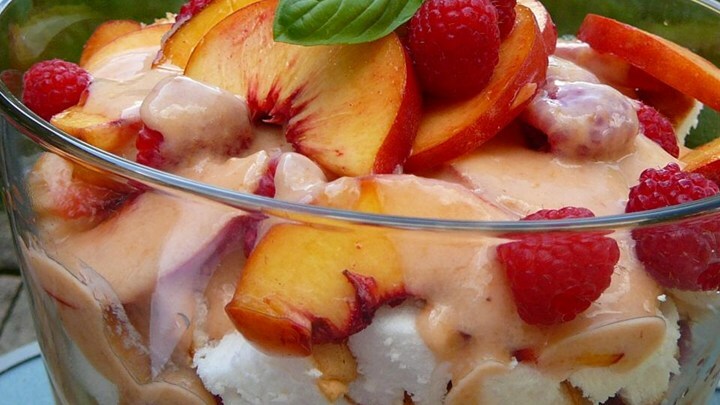 Garnish with peach slices and fresh raspberries. Refrigerate until ready to serve.